BUDAPEST — In the fall of 1956, the Soviet Union crushed an uprising in Hungary, swiftly ending an attempt to escape the superpower’s grip on the Eastern bloc. The Soviet tanks that rolled through Budapest also brought an end to the belief of many intellectuals and artists here in the ideals of Communism. The Hungarian composer Gyorgy Kurtag, then 30, felt his whole world collapse that year. “Not just the outside world, but my inner universe, too,” he once said in an interview. Mr. Kurtag spent the next two years in Paris, seeking new meaning for his life and work under the guidance of a psychoanalyst. He studied with the composer Olivier Messiaen, and heard the music of Anton Webern and Arnold Schoenberg at concerts given by Pierre Boulez. From the isolation of Communist Hungary, he had emerged into the West’s center of musical modernism. It was in Paris during this period that Mr. Kurtag first saw Samuel Beckett’s play “Endgame.” The encounter set him on a lifelong journey, studying Beckett’s works and creating music inspired by them. Six decades later, on Nov. 15, this odyssey — and the career of one of the last living giants of 20th-century music — will culminate in Mr. Kurtag’s long-awaited, long-delayed first opera, based on “Endgame,” at the Teatro alla Scala in Milan. In an interview last month in his attic study at the Budapest Music Center, where he lives with his wife, Marta, Mr. Kurtag, 92, spoke about the importance of opera to him. (Stuffed with papers and books, the study has whole shelves devoted to Beckett.) The art form, he said, brought together his two great passions: the spoken word and the singing voice. Mr. Kurtag was born to a Hungarian Jewish family in Lugoj, Romania, in 1926. He studied piano, chamber music and composition in Budapest, where he met his wife, also a pianist. They married in 1947. Reducing music to its intense essentials, Mr. Kurtag cultivated a style of precisely controlled intensity. His works are often collections of tiny bits — some of his set of 40 “Kafka Fragments,” for soprano and violin, are just a few seconds long — which pack a concentrated punch, extravagant in expression while rigorously focused and astringent. He is perhaps the last of the great generation of European composers to have come of age in the wake of World War II: Gyorgy Ligeti, a friend, died in 2006; Boulez, the dean of the postwar avant-garde, in 2016. Mr. Kurtag’s 1994 orchestral work “Stele” is “like a gravestone on which the entire history of European music is written,” the conductor Simon Rattle once told The Boston Globe. Throughout his career, Mr. Kurtag, who speaks six languages, has made music out of the literature he loves. A handful of works inspired by Beckett have included “Samuel Beckett: What Is the Word,” based on a late poem. Mr. Kurtag wrote it for the Hungarian singer Ildiko Monyok, who had developed severe aphasia in a car accident. Ms. Monyok learned to speak again while rehearsing the piece with Mr. Kurtag, and her struggle was reflected in the composition: a harrowing landscape of stuttering repetition, of language trying reluctantly to form itself. That reluctance to be formed has been a feature of Mr. Kurtag’s “Endgame,” too: The music world has been waiting for it for years. Mr. Pereira, of the Teatro alla Scala, has penciled it in for every opera season he has overseen for almost a decade — at the Zurich Opera, then the Salzburg Festival, and now in Milan — only to be told, again and again, that it wasn’t yet ready. “Endgame” — Kurtag’s libretto adapts Beckett’s original French version, “Fin de Partie” — is, like the play, a tragicomedy of four characters: the tyrannical master Hamm; his mother, Nell; his father, Nagg; and his servant, Clov. Beckett included copious stage directions alongside the gnomic dialogue as the characters discuss, with dark humor, the meaninglessness of the human condition. Only Clov moves around freely: Hamm stays still in a wheelchair at the center of the stage, and his parents sit in dustbins at the side. Every note matters in Mr. Kurtag’s miniatures, and although “Endgame” is around two hours long, he applied the same painstaking method to its composition as he has to his shortest pieces. He is as hard on himself as he is on his performers; the cellist Tamas Zetenyi described playing a Kurtag string quartet at a concert in Budapest. At the end, its composer stood up to thank the group — and proceeded to give 90 minutes of feedback. Marta Kurtag was a partner in the new opera’s creation, as she has been in the composing and performance of many of Mr. Kurtag’s works. (Much of his continuing series of short piano pieces, “Jatekok,” or “Games,” has been written with their duet in mind.) When asked a question by a reporter, he sometimes simply offered a smile when a precise answer wasn’t forthcoming; his wife would then answer. At other times, she interjected to gently clarify or contradict Mr. Kurtag’s point. If it’s in part an exaggeration, “Endgame” remains the crowning achievement not just of Mr. Kurtag’s career, but also of the couple’s creative relationship. The interview in Budapest began with his tribute to Mrs. Kurtag. Moving with difficulty, a walker supporting his frail figure, Mr. Kurtag visibly softened as he sat at the piano. There, he performed what he called a “pocket opera” that he wrote for his wife’s 90th birthday this year. His eyes gleamed and his lips joined in a smile as he turned to Mrs. Kurtag. He recited two lines from the Hungarian poet Attila Jozsef, written in French, that roughly translate as “I have no theme other than that I love you.” He then took the syllables apart, repeating each one until the line of poetry was impossible to pick out among the bare sounds. Each repeated phrase resolved itself with soft chords. He said he didn’t see his own life playing out in his new Beckett opera, and yet he felt that Mrs. Kurtag and himself were present in the piece. “It is us who are in ‘Fin de Partie,’ ” Mr. Kurtag said. I just downloaded yesterday's RAI Radio 3 & Bartok Radio b'csts and plan to listen over my T-giving break. Kurtag is a fairly well-known avant-gardist. I have lots of his chamber and orchestral works. It actually does look like a production of Beckett's "Endgame." http://5against4.com/2017/03/05/gyorgy- ... -premiere/ For about as long as many people can remember, Romanian composer György Kurtág has been working on his first opera, based on Samuel Beckett’s Endgame. It’s been announced, postponed, re-announced and re-postponed to the point where one begins to wonder if it will ever become a reality, but if all goes well, the opera will finally be unveiled in Salzburg next year. In the meantime, Kurtág has made available a typically minuscule sliver of music either directly taken or derived from the opera, in the form of a three-minute work for string quartet, titled Clov’s last monologue (a fragment). It’s cast in a simple ternary form structure (A1-B-A2), quickly establishing – after a fortissimo opening blast – an achingly fragile but lyrical primary idea. A wafer-thin melody that falls more than it rises, Kurtág barely nourishes it with bleached harmonies and almost casually disinterested pizzicati, in the process providing just the barest hint of development. This is contrasted with a middle episode that places the cello in the foreground, focusing more demonstratively on melody, the upper strings concerning themselves with more fast-moving material. The quartet unites briefly before splitting into what sound like two duos, the violins responding to the viola and cello, with echoes of the main idea, before finally uniting again. Kurtág then returns to the opening, simply stating its main idea again before evaporating it in a pizzicato rendering that closes with one of new music’s most utterly enfeebled harmonic whimpers. Samuel Becket, who insisted in his lifetime on complete artistic control of every one of his works no matter where in the world it happened, would never have allowed this. I guess he left no estate that maintains that standard, so I would have to take an opera of Endgame on its own terms. Incidentally, ham and clove, which makes no sense in French, is an actual dish in which a ham is studded with whole cloves. My mother used to make it. That does not explain the complicated relationship of the two characters in the play, but there it is. The Beckett estate has barred productions of his works for various reasons, such as an all-women "Godot," so they're still guardians at the gates. Like you, I was surprised that they allowed an operatic treatment, but maybe Kurtag provided them with a recording that impressed them. Beckett's mentor James Joyce was an enthusiast of opera, and maybe Beckett shared that enthusiasm and his heirs take it into account. Joyce was an enthusiast of opera, and maybe Beckett shared that enthusiasm and his heirs take it into account. 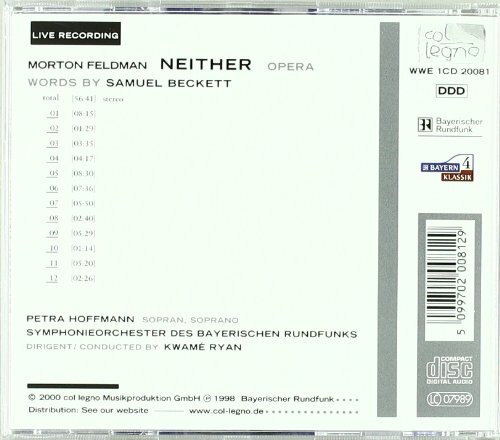 Beckett and Morton Feldman collaborated on an opera, loosely defined, entitled Neither, recorded in 2000 by col legno. 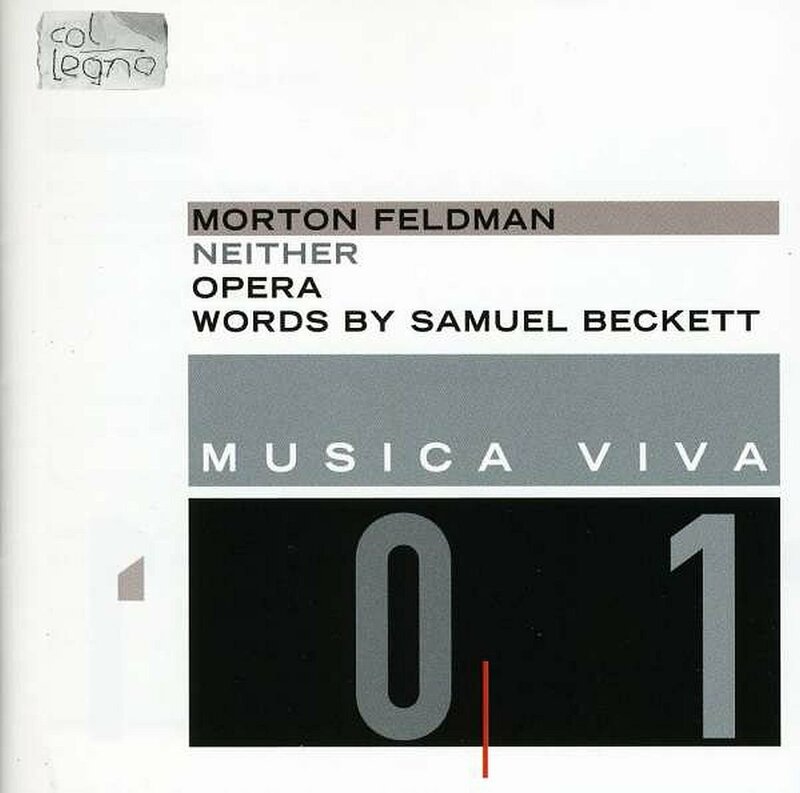 Neither is the only “opera” by Morton Feldman, dating from 1977. Its “libretto” is a 16-line poem by Samuel Beckett. Composer and librettist had met in Berlin two years earlier with plans for a collaboration for Rome Opera, but in their encounter Beckett had told Feldman that he himself did not like opera, and Feldman had echoed Beckett’s sentiment, so that the work emerged in Rome as a setting for soprano soloist only, accompanied by orchestra. It could theoretically be termed a “monodrama,” but given the creators’ disdain for opera, the label “anti-opera” fits better. Many people don't know that James Joyce was himself a world-class tenor. In a competition of Irish tenors, he was beaten only by John McCormack. I keep dropping names because I've lots of names to drop. In Berlin I saw a production of "Endgame," in German, directed by Beckett himself. It was at the Schiller Theater Werkstatt. The most straightforward, natural thing in the world, and very funny - which you wouldn't guess from reading the script. György Kurtág and I had met in London back in the 80s thanks to Claudio Abbado. at the time to take his place. pieces one day Kurtág seemed to suggest?... but not an opera. No thank you. dream that astonishingly became over a period of eight years, an absolute reality. repertoire of the XXI century. rewriting of a completely new text. Schumann, in their song cycles by writers such as Heinrich Heine and others. Still this radical method constitutes an operatic first. occasional passages of music without words. does it in a method which in effect contradicts Beckett’s own. Hamm makes Clov explore the room as a journey round the Globe. compassion and ruthlessness that Beckett engraves in every word they speak. timeless relevance in a new light. Unless I missed something, Audi doesn't say how they obtained permission to perform this opera, or whether they did. He's an experienced man of the theatre and must have been aware of the need. Kurtag: Fin de partie (Endgame) - La Scala world premiere - audio only. I assume this is sourced from either the Bartok Radio or RAI Radio 3 broadcasts of 11/15/2018. Four people live in the cramped space of a house by the sea: Hamm, an elderly gentleman confined to a wheelchair; his servant Clov who is instead unable to sit down; and Hamm’s very old parents, Nagg and Nell, neither of whom has legs, and who are stuck in two dustbins. The four living together proves difficult. Hamm cannot stand the presence of his parents and their chit-chat; Nell can hardly bear Nagg, while Clov cares for the other three with a detached, sarcastic air of weariness. All four are waiting for an end to this static, claustrophobic situation with its lack of possible developments. The first character to appear is Nell, whose words recall a dim glimmer of memory: the sound of footsteps, the only sound to be heard on the beach (1. Prologue). Then Clov and Hamm appear; the servant is troubled and uneasy on his legs and he makes repetitive gestures, interspersed with short, nervous laughter; these are the same gestures he makes every day while carrying out his domestic chores (2. Clov’s Pantomime). The servant then expresses his conviction – or is it his hope? – that the situation in which he finds himself is about to end (3. Clov’s First Monologue). Hamm, on the other hand, reflects on his own sufferings and on those of his parents: despite a feeling of despondency and of exhaustion, he claims that he is incapable of bringing things to an end (4. Hamm’s First Monologue). The lives of Nagg and Nell are sorely tried by their tremendous invalidities and exhausted by the wear and tear of time, by the monotony of their usual bickering, and by their mutual lack of comprehension; in the middle of their conversation, the memories resurface of their tandem cycling accident in the Ardennes, when they both lost their legs, and then of a boat trip on Lake Como. These are the only memories that still make them laugh and, at least apparently, give them a little nostalgia for a life spent together. Yet, Hamm, who wishes he could sleep, is irritated by his parents’ chattering and orders Clov to throw the bins, along with Nagg and Nell, into the sea. In the meantime, Nell dies: but none of the other characters appears to even notice (5. Bin). Hamm wants to tell Nagg a story: in days gone by, a father had come to him on Christmas Eve asking for bread for his son and Hamm had decided to take him on (6. Novel). Nagg remembers when Hamm was a child and needed him (7. Nagg’s Monologue), then Hamm reflects on his difficult relations with others (8. Hamm’s Penultimate Monologue), before asking Clov for his tranquilliser: the servant replies that there are no tranquillisers left (9. Hamm and Clov’s Dialogue). Hamm then tells Clov that he no longer needs him. Still, he asks Clov to say something that he may remember before leaving; Clov remarks that, up until that moment, Hamm had never spoken to him and that only now, as he is about to depart, does his master pay him any attention (10. “It’s over, Clov” and Clov’s Vaudeville). It is time for Clov to reflect on his condition: he has never understood the meaning of words like “love” and “friendship” and yet he feels old, weary, incapable of forming new habits; he is bound to the physiological cycle of a daily life that is repetitive and always the same (11. Clov’s Last Monologue). As Clov is about to go, Hamm thanks him (12. Transition to the Finale). Then, even though Clov is on the very point of leaving, but he has not yet moved, Hamm realises he has been left alone (13. Hamm’s Last Monologue): it is up to him – and only him – to continue playing the endgame (14. Epilogue). MILAN — In the middle of Samuel Beckett’s bleak but endlessly wry play “Endgame,” a character tells a joke about a man who goes to the tailor to get a pair of pants. The tailor dithers and dawdles, making one tiny change at a time. The punch line had extra relish at the Teatro alla Scala here in Milan on Thursday when “Fin de Partie,” the eminent Hungarian composer Gyorgy Kurtag’s operatic adaptation of “Endgame,” had its long, long-awaited premiere. Mr. Kurtag, 92, has taken a protracted path to this patiently, perfectly tailored work, his first opera. Over the past decade, we were told time and again that the opening was coming. Time and again, the pants were not quite ready. “Fin de Partie,” based on Beckett’s original French version of the play, became the white whale of contemporary music. As Mr. Kurtag turned 85, then 90, we could be forgiven for quietly fearing it would never be finished. And it wouldn’t, perhaps, have been too much of a surprise if it hadn’t been: A master of miniatures, best known for collections of pieces a few dozen seconds each, Mr. Kurtag had stubbornly resisted the idea of working on a vaster canvas. But Beckett had already provided him with vital inspiration for other works over the years. And “Endgame” — its text, like Mr. Kurtag’s classics, an assemblage of small self-sufficiencies surrounded by space — was an apt partner for what the play calls “the prolonged creative effort.” If Mr. Kurtag felt uncertain about how to sustain his gnomic style over a two-hour span, it’s undetectable in an opera that, even constructed as a series of discrete “scenes and monologues,” unfolds with the confidence — the paradoxically unsettled serenity — of his best music. He can revel in mood, color and agile, even raucous, rhythms because there is barely a plot to convey. A sick man in a wheelchair (Hamm), his companion (Clov), his father (Nagg) and his mother (Nell) recall the joys and sorrows of the past and curse the indignities of the present and future. That’s all; that’s everything. Shuffling around nervously, Clov (the robustly gruff baritone Leigh Melrose) is characterized in jittery blots of music, as if he consists entirely of punctuation marks. The orchestra quietly trembles under the bass Frode Olsen’s more authoritative roars as Hamm. Old Nagg (the tenor Leonardo Cortellazzi) and Nell (the contralto Hilary Summers), stuffed by Beckett into side-by-side ashcans, exist in a sphere of ethereal nostalgia and thread-thin high notes that Ms. Summers, in particular, spins with the eerie softness of elderly skin. There are echoes of Monteverdi in the piece’s declamatory, text-forward quality; Debussy’s “Pelléas et Mélisande,” in its atmospheric ambiguity; Berg’s “Wozzeck,” in its episodic structure and concentrated expression. Glistening and nimble, the Scala orchestra is conducted by Markus Stenz, who leads an exceptionally delicate score — its balances and pauses fragile and exposed — with naturalness and a sense of spontaneity. Pierre Audi’s staging provides some of the physical comedy Beckett intended, while slyly inverting the play’s scenic indications. Rather than looking out from an interior, the characters here are outside a small, grim house, looking in. (The designer is Christof Hetzer.) The house, partly overhung by the shells of yet larger structures, rotates with each scene change; Hamm, in turn, rotates in his wheelchair. It is a little solar system onstage, a theater of the cosmos. I had worried that Mr. Kurtag would stint the music-hall roots of Beckett’s dramaturgy, but bits of accordion and whistles peep out from the orchestra, faraway glimpses of vaudeville. The opera extracts roughly half of the play, meaning we lose some of the slapstick circularity; what’s gained is starkness, each episode standing in harsh isolation. “Fin de Partie” is a farewell not just to a life and a marriage, but also to a whole culture. Mr. Kurtag is one of the last who remain of the generation of avant-garde composers that came of age during World War II and in its wake: Boulez, Ligeti, Henze, Stockhausen, Schnittke. Even if the great final scene equivocates — modernism is always on the verge of leaving, it seems to say, yet it is also always here to stay — the opera, drawn from a play that Mr. Kurtag saw in Paris as a young man, is truly goodbye to all that. It’s a world that ends, in his telling, with both a bang and a whimper: apocalyptic brass chords alternating with a hushed stillness, off which rises a mist of cimbalom and suspended cymbal. This kind of quick transition from seizure to stillness is a characteristically Kurtagian move, as in the final of his six “Moments Musicaux” for string quartet, from 2005, when a sudden ripping roar fades to a faint march, pricked by an even fainter violin. It is a gesture that challenges the very notion of an ending. And Mr. Kurtag may not be done yet; he has mulled filling in some of the gaps he has left in creating the “Fin de Partie” libretto. Future presentations — the work travels next to Amsterdam, in March — may well set more of the play’s text. But it by no means feels curtailed in its current form. Look at our world, indeed, then look at this exquisite opera, a miracle of dedication, craft and care. This, as Clov says near the end of the piece, is what we call making an exit. Through Nov. 25 at the Teatro alla Scala, Milan; teatroallascala.org. A version of this article appears in print on Nov. 17, 2018, on Page C1 of the New York edition with the headline: A Premiere Extra Long In the Works.